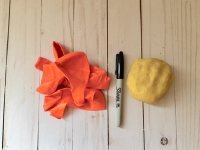 These play dough-filled sensory balls are inexpensive and easy to make. The great thing about this craft is that once you are done making your sensory balls, children can have fun playing with their creations. Stretch and hold a balloon open. Have a child stuff it with play dough until it is nice and round. Tie a knot at the top of the balloon. 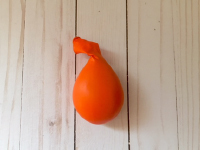 If you wish, stretch a second balloon over the first one to make your sensory ball more durable. Now for the fun part! 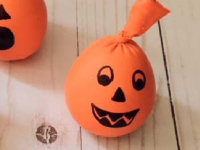 Using the marker, draw a fun Halloween face on your sensory ball. Sensory balls are fun to have around the house. I was surprised how often I saw my kids playing with these little guys. They would be a great addition to a calm down bag or they could be left in your vehicle for long car rides.